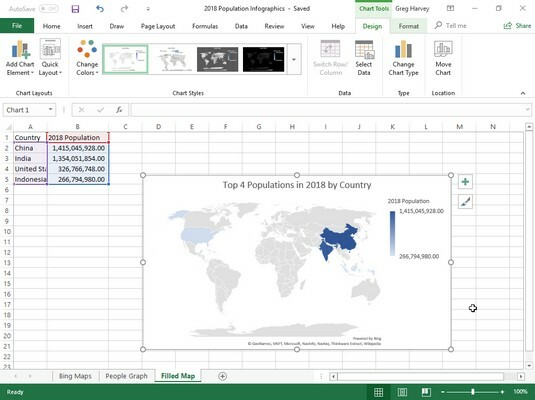 Excel 2019 enables you to easily add basic infographics to your worksheets from the Insert tab of the Ribbon with the addition of Bing Maps and People Graph to the drop-down menu on its Add-Ins button, and the Filled Map option in its Maps button. These infographics enhancements enable you to create visual representations of regionally related worksheet data that can point out trends and quickly convey their most pertinent information. 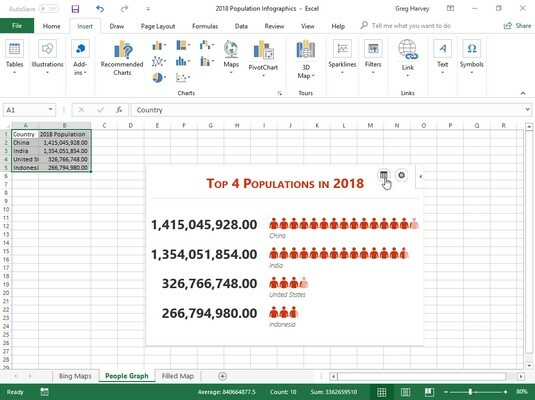 To see just how easy it is to use Excel 2019’s infographics, try creating a simple worksheet that contains two columns of data. The first column contains four country names (China, India, USA, and Brazil) and the second contains associated population figures (from 2018 data). This image shows the infographic that was created with the Bing Maps add-in for this data. Adding a Bing Maps infographic to the illustrate the 2018 population by country data in a worksheet. Position the cell cursor in one of the cells of the table with the population data (A1:B5). Click the Bing Maps button on the drop-down menu attached to the Add-ins button on Insert tab of the Ribbon (or press Alt+NZ1A1). Click the Show Locations button (the leftmost one in the top row) of the Welcome to Bing Maps graphic. That’s all there is to it. Bing Maps automatically draws a 2-D map of the world including the four named countries and draws blue circles in each of them, representing the relative size of their populations (according to the values in the B column of the Excel data table). If you wanted to, you could then use the Settings button (the second one on the top row with the cog icon) to change the default formatting of the population infographic or even filter its data with the Filters button (the third one on the top row). Open the worksheet with the population data table. Click the People Graph button on the drop-down menu attached to the Add-ins button on Insert tab of the Ribbon (or press Alt+NZ1A2). Click the Data button (the one with tiny worksheet icon) at the top of the Numbers About the App default infographic. When you click the Data button, a Data panel appears in the default infographic where you can select the data to be represented as well as change the title. Select the placeholder title text (Numbers About the App) in the Title text box and then replace it by entering your own title. Click the Select Your Data button in the Data panel right above the Title text box and then drag through the cell range with the labels and values you want used in the new infographic before you click the Create button. Adding a People Graph infographic to the illustrate the 2018 population by country data in a worksheet. As soon as you click the Create button, the People Graph add-in replaces its default infographic with the title and Excel data you specified. You can then use its Settings button (the one with the cog icon) to modify its formatting if you so choose. 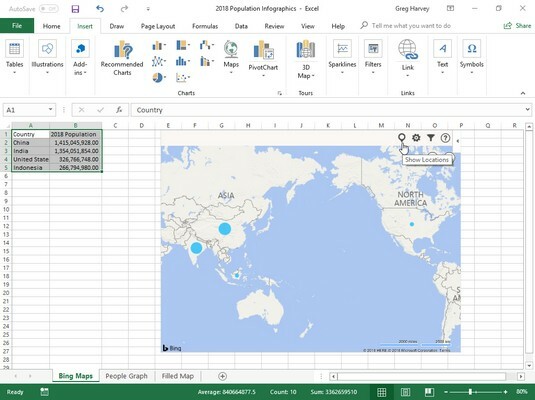 The image below shows the Filled Map chart created using the same population worksheet data as for the Bing Maps and People Graph infographics above. This is the easiest of the three to create. All you have to do is position the cell cursor in one of the Excel cells with the population data before clicking the Maps button on the Insert tab of the Ribbon. Adding a Filled Map chart infographic to the illustrate the 2018 population by country data in a worksheet. Excel immediately created the Filled Map chart shown above. All that was done then was to replace the Chart Title placeholder with the Population (2018) chart title shown here.